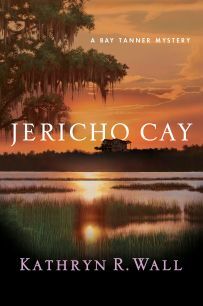 I just wanted to share with all the mystery lovers out there news of the recent release of the latest Bay Tanner mystery, “Jericho Cay“, by one of my favorite authors, Kathryn Wall. 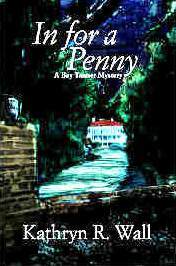 This is the 11th book in this series set in the Hilton Head, S.C. area. Her newest employee–her husband Red–is hot to pursue the inquiry. Looks like I’ll be adding this one to my summer reading list! I haven’t had too much time this week to do a lot of reading, as we were on the west coast of Florida visiting old friends we had not seen in forever, it seems. The Gulf coast area is beautiful this time of year! But I had better get going – I am reading “Tough Customer” by Sandra Brown. Waiting on my desk are “Perdition House” by Kathryn R. Wall, and “Endangered Species” by Nevada Barr, and I stopped by the library on my way home today and spotted a copy of “The Girl Who Kicked the Hornet’s Nest” by Stieg Larsson, the third in his trilogy, so I grabbed it. I was surprised to see it available, as I was on the waiting list at the library for his second book for 2-3 months. If you have not read any of the trilogy by Stieg Larsson, I would highly recommend them. It would be helpful to start at the beginning with “The Girl With the Dragon Tattoo” and then his second, “The Girl Who Played With Fire”. Many elements of the plot carry forward from the first book into the second, so you will enjoy the series much more if you take them in order. This author was Swedish, so all the names and places in his books are Swedish, which makes it a little harder to pronounce them and to remember who is who. His first book has so many characters from the same family, there is a family tree in the beginning for you to refer to if you can’t remember. But don’t let that put you off, or you will be missing out on some great fiction. It’s not so important that you remember all the characters’ names and relationships, as long as you can get the main ones down and the gist of what is going on. None of this detracted from my enjoyment of the book. The author has created a great character in Lisbeth Salander, very different and interesting, and there is a lot of action, intrigue, and excitement. Sadly, Mr Larsson passed away at a young age, just after completing this trilogy, so he never lived to see the tremendous success he has become. I would have loved to read more from him. I will report on “The Girl Who Kicked the Hornet’s Nest” when I finish it. But please get started on the others – you won’t be sorry.